I know that many of you are planning your lessons for January. 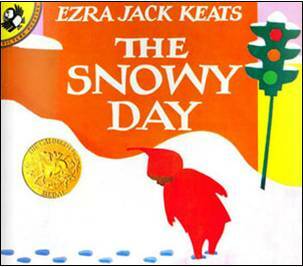 The Snowy Day by Ezra Jack Keats is a classic book about a young boy who goes outside to play in the snow. This wonderful winter book can be used for making predictions, inferring, teaching vocabulary, comparing, asking and responding to questions, sequencing, and retelling. You could create your own thematic unit and teach this book for the entire month. Internet resources for this book are endless! I used The Snowy Day in Early Childhood Special Education classrooms, but is appropriate for primary grades as well. The Snowy Day is easily found in libraries and can be read on-line. One on-line version of this book can be found at the Official Website of the Ezra Jack Keats Foundation. I like this animated version of The Snowy Day as, unlike YouTube versions, you can easily stop to talk about each page of the story. Look at the real-life version of The Snowy Day, on the Activities page. Label objects and actions found in The Snowy Day - click here to download object and action pictures from BoardmakerShare. Also included are five visuals for print awareness. At Teaching Heart.net, you will find questions to ask students and some suggested vocabulary. This page could be helpful when planning your therapy sessions. Talk about clothes that you wear in the winter. Take pictures of students wearing mittens, a coat with a hood, hats, boots, etc. Make a books with carrier phrases such as She is wearing a scarf. or Diana is wearing boots. to work on pronouns, classmates names and/or present progressive tense. Use PowerPoint's Photo Album feature to make these books. If you don't have time to make these for individual classes, use pictures of people or cartoon characters found on the web to practices sentences such as The girl is wearing boots., Santa has mittens., or He has a coat. Teach the concepts long and short using scarves. Purchase some dollar store or thrift shop scarves and cut some to make them very short. Put them in a box leaving one end of each scarf hanging outside the box. Students will pull the desired scarf and classify it as long or short before putting it around his or her neck. Download The Snowy Day Adventure Pack at Reading Rockets to find activities for parents as well as many that you could adapt for therapy. Download The Snowy Day Printables at Home School Creations to find phonemic awareness activities and a winter/summer clothing picture sort. Throw big and/or little snowballs (pom-poms or Styrofoam balls) over the snow fort. Stand behind, in back of or in front of the snow fort. Our snow fort was a small table covered with a white sheet. I also found great language activities at Cochlear Implant's On-line Snowball Fight! Retell the story or sequence story pictures. Find story pictures, lesson plans and more at Webbing Into Literacy's A Book a Week: Classroom Instruction (scroll down to see The Snowy Day). HomeSchoolShare.com also has a nice set of sequence cards in the free The Snowy Day Lapbook and Printables. KinderGals' retelling activity is a little more involved, but excellent. You could simplify the activity for therapy by using only a silhouette for Peter and put together materials prior to the lessons. Teach the concepts hot and cold. Use cold packs to demonstrate cold and a heating pad for hot (not too hot). Sort pictures of hot and cold items. At Hooked on Teaching, students wrote an additional ending to the story to tell what Peter and his friend did on the second snow day. Discover the World of Ezra Jack Keats, at PenguinGroup.com, contains activity suggestions for The Snowy Day and many of Keat's other books. This will be my last post until after the holidays. In January, visit my blog for two great app giveaways. I hope that all of you relax and enjoy time away from work! I love that you're using award-winning and GOOD literature! Thanks for all the ideas :-). Enjoy break! Great post! I picked up CC's The Snowy Day speech-language pack over at her If I Had Super Powers blog and it's great! Getting excited about January and reading this book! Thanks for all these awesome resources!! Well you just made my lesson plans that much stronger for January. Thank you! I just fixed all of the broken links so you should be able to access all.